Manchester United lasted THIRTY seconds before conceding against Chelsea at Stamford Bridge, THIRTY seconds. A defensive mix-up from the same defence that went 90 minutes without falling asleep once at Anfield, today spent 90 minutes falling asleep. The Spaniard couldn’t help with three of Chelsea’s goals, but on Pedro’s goal, his positioning has to be questioned. Today, De Gea’s back four, bar Antonio Valencia, might as well had gone home. 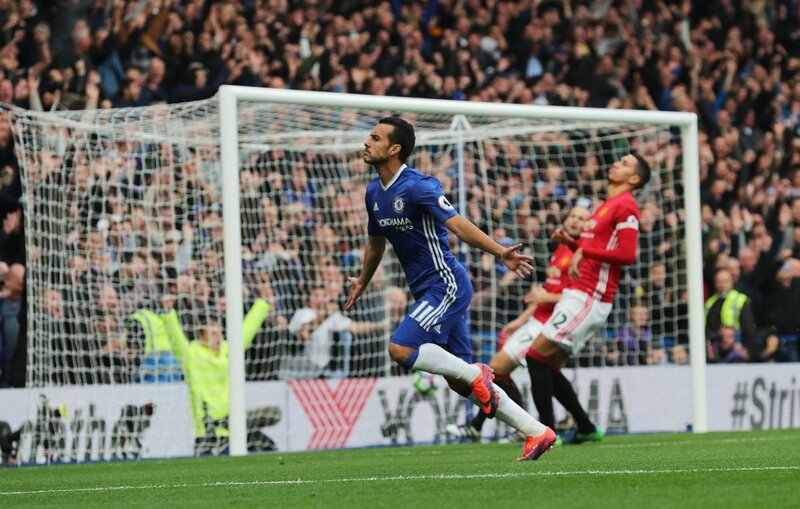 A lack of communication between himself and Chris Smalling allowed his Spanish companion Pedro to pounce, before slotting home for Chelsea. It’s a day where United’s number one must wonder why he’s not bathing in the scorching hot Spanish sun. After a superb display at Anfield, Valencia again proved why he deserved to start ahead of Darmian, or anyone else challenging for the right-back spot. The Ecuadorian tried to make things happen for United today and again, was robbed of an assist from Zlatan Ibrahimovic. Zero? Isn’t that a bit harsh? No. Smalling, who was captain today, couldn’t have been further away from setting the correct example. The centre-half replicated his performances against both Tottenham and Arsenal, and was turned by N’Golo Kante, whose head is level with Smalling’s waist. Dismal, dismal performance. The Ivorian didn’t last the full 90 minutes due to an injury, but alongside Smalling, he put on a poor display. Although, he did pull off some vital challenges and was slightly better than Chris Smalling, which wasn’t much of an achievement. Today, it seemed Blind’s surname was given to him from his performance against Chelsea. Shocking. The Dutchman has been vital in games this season for United, but today he was weak, slow and put on perhaps his poorest performance in a Manchester United shirt. The Spanish midfielder attempted to make things happen alongside Pogba, but ultimately failed. Was perhaps United’s brightest spark but with N’Golo Kante’s goal, Herrera, as Gary Neville put it, was embarrassing. Fellaini offered very little in midfield, highlighted when he was taken off at half-time. The Belgian acted as a lamppost, watching the traffic drive past whilst he stood on his laurels. Juan Mata came on in replace of Fellaini, attempting to make this happen, but it wasn’t to be. The Frenchman repeatedly complicated the simple pass, trying to take on one or two extra players than was needed. The world’s most expensive player was caught in possession several times and failed to take hold of the game, which is something he was brought in to do. Offered very little going forward, but had little energy to after working hard doing his defensive duties. Seemed to have a lack of freedom, and almost played as a right-back, leaving little room for any attacking moments. The Swede, for the third game in a row, missed another chance that a player of his level should be scoring. The forward was stagnant all game, and had to drop deep on almost every occasion due to the lack of service. The 18-year-old, like Jesse Lingard, was occupied with his defensive duties in a game plan which failed. Used all of his energy lending a hand to the defence, leaving him lacklustre once he crossed the half-way line.